Recently I was invited on a trip called Wines Without Borders. 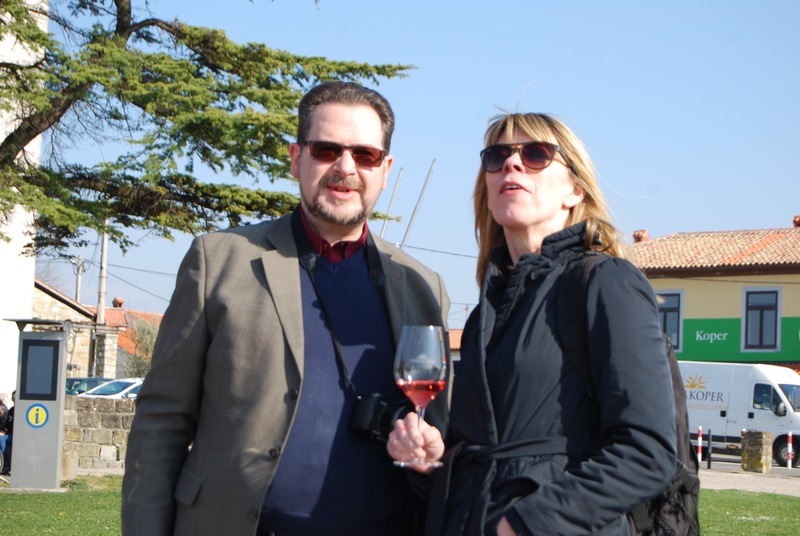 It was organised by my friend Paul Balke and we visited the wine regions of Colli Orientali, Collio and Friuli Isonzo in north eastern Italy and Brda, Vipava Valley and Koper in Slovenia. 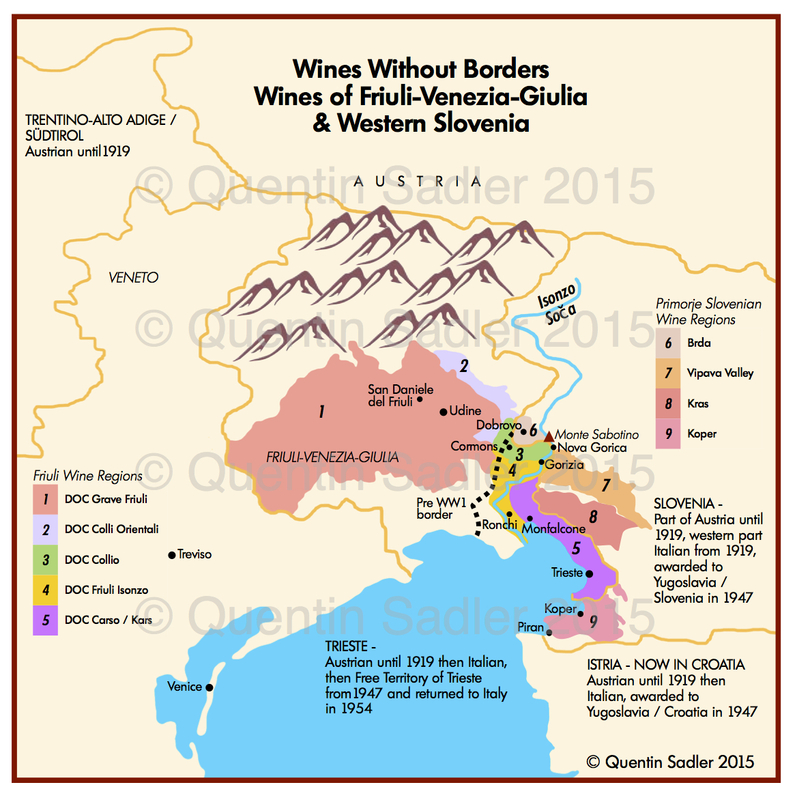 Sketch map of the wine regions of Friuli and Western Slovenia. Border changes are also shown. The whole focus was that the modern borders of the area bear no relation to reality and are merely lines on a map that ignore the peoples and cultures that straddle them. I was aware that the Slovenian people are to be found on both sides of the frontier, although the ones in Italy are often outwardly Italian and speak Italian, at least to foreigners. Most of what we now call Slovenia was for centuries part of the Austro-Hungarian Empire and much of Slovenia remains very Austro-Germanic. Ljubljana, the delightful capital city – called Laibach in imperial times – was largely destroyed by an earthquake in 1895 and was rebuilt in an Austrian style, so resembles parts of Vienna, Budapest and Prague. Most menus offer dumplings, schnitzel and cream cakes, while the inns and coffee houses often resemble those of Vienna. What’s more that great Austrian icon, the Lipizzaner Horse – of Vienna’s Spanish Riding School fame – has been bred at the Lipica Stud Farm in western Slovenia for over 400 years. Piran looking out to sea. 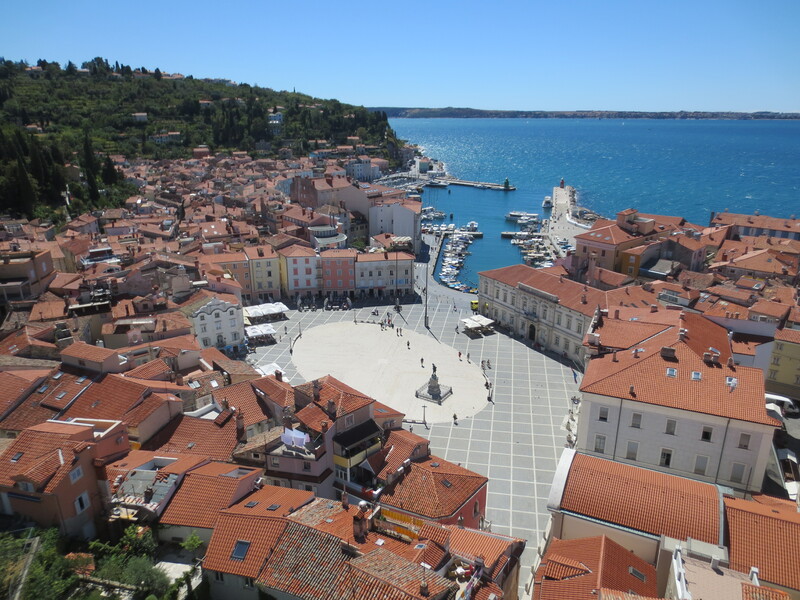 Piran Tartini Square was originally an inner harbour, boat trips leave from Piran for Venice every day. 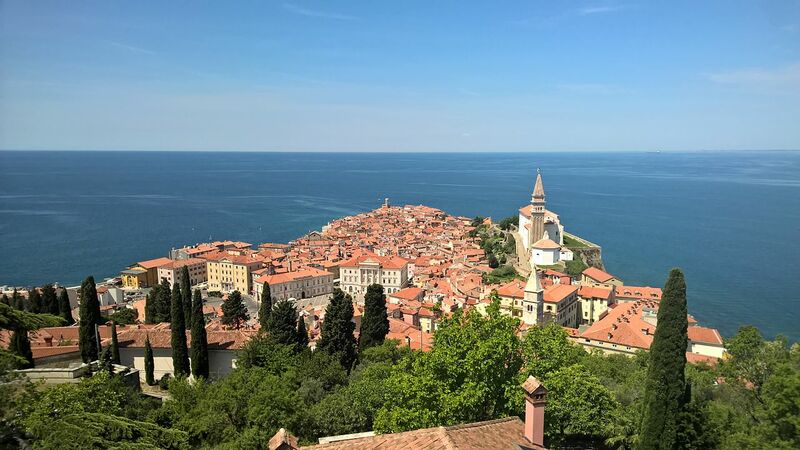 Some of the western parts of Slovenia also have Italian influence, the coastal towns were all originally Venetian and rather charmingly still look it – Piran is one of the loveliest and most elegant seaside towns that I have ever visited. Even today people in these coastal zones often speak Italian, pasta is on every menu and the ice cream is as splendid as that in Italy itself. As for Friuli in that north eastern corner of Italy, all of it together with Veneto had been in the old Austrian Empire until 1866. Right up until 1914 the border was a little further west than it is now. Trieste was Austria’s principal port – it still has an Austrian / Mitteleuropean feel – and further to the west Trentino-Atlo Adige (Südtirol) was still Austrian, infact the border cut through Lake Garda. The First World War changed everything here. The Isonzo Front went right through the frontier zone between Italy and Austria, basically following the line of the river and the mountains, and the brutal fighting in these mountains was as hard as anything seen in Flanders. At the end of the war the Italians had seized Trentino-Alto Adige and the mixed Slovene / Italian city of Trieste. Both are still part of Italy today, while the western regions of what is now Slovenia – including the Istrian Peninsula – only remained Italian from 1919 before being handing over to Yugoslavia in 1947 before being inherited by Slovenia and Croatia in 1991. After the Second World War Slovenia was a Republic within Tito’s Yugoslavia, and although the country was relatively liberal and outward looking by Eastern European standards – Yugoslavia was never part of the Warsaw Pact – the border was still strongly guarded. 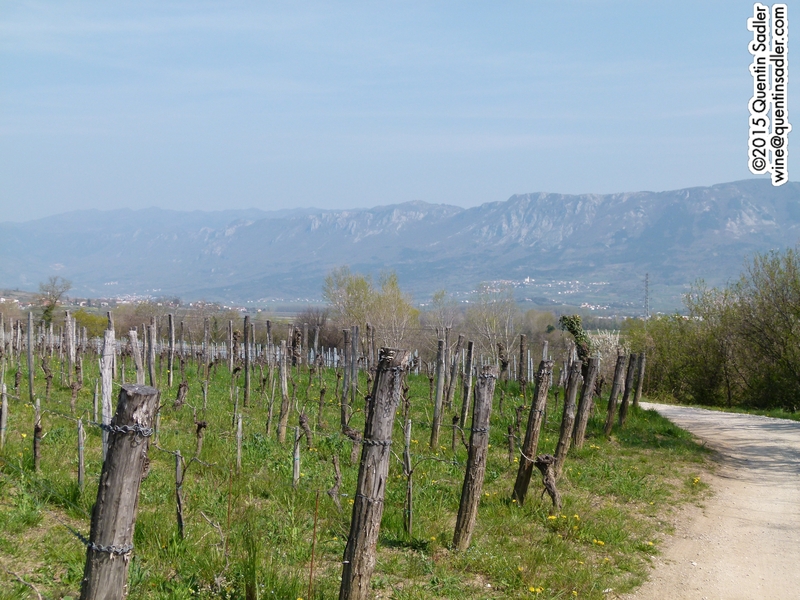 This gave winemakers all sorts of problems as the border was drawn in such a way that it often cuts through vineyards, so many growers found themselves growing grapes in both Italy and Yugoslavia. Nowadays of course both Italy and Slovenia are members of the EU, so the border is open and there are umpteen unguarded crossing points. Back then there were many fewer frontier posts and it was all more rigorously controlled, with growers having to drive hours out of their way in order to be able to tend grapes that grew only yards from their home. Anti Europeans often forget many of the good things that have come about because of the EU. 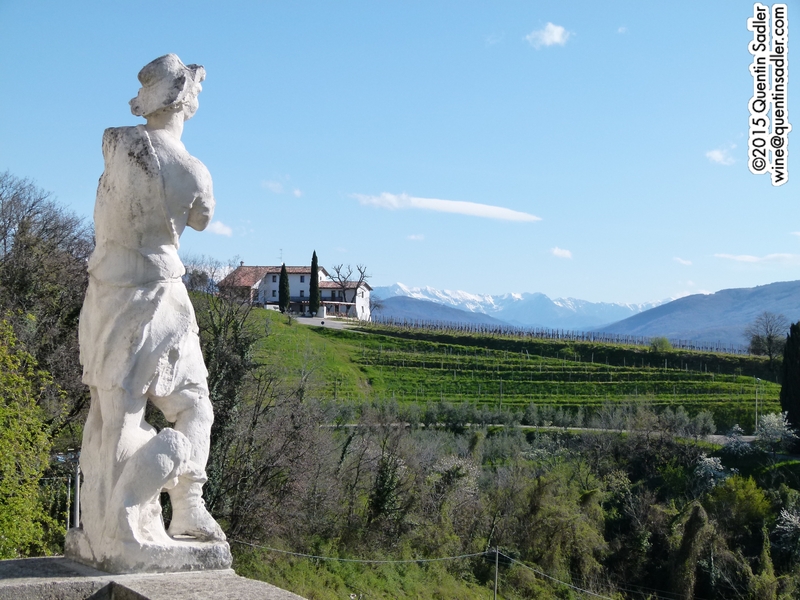 The border situation is most dramatic in Brda, which is arguably the most important wine region in Western Slovenia, it is certainly the most famous. 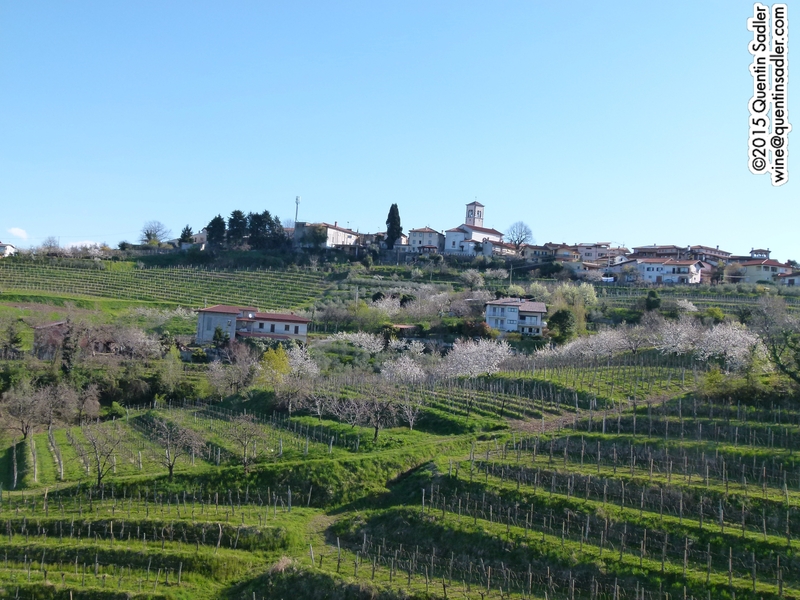 Brda means hills in Slovenian and is simply a part of Italy’s Collio region that was detached when the border was fixed in 1947 – Collio means hills in Italian. Of course they also use the classic international grapes like Chardonnay, Sauvignon Blanc, Cabernet Sauvignon and Merlot and have done for centuries. Interestingly Cabernet Franc often appears on labels here, and indeed it is grown, but the grape actually used is very often Carmenère. Just as in Collio it is very hard to generalise about the wines as such a wide range of grape varieties and blends is used, but this does for make for very exciting variety. 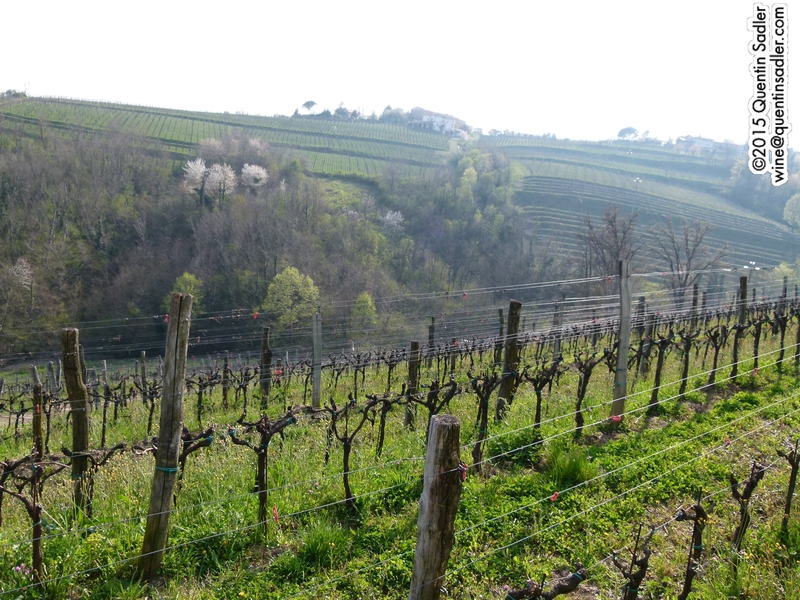 The beautiful vineyards of Brda. The general quality is very high indeed, even from the local cooperative which is the largest producer in Slovenia. Most of the producers though are boutique wineries using organic techniques and low sulphur in their wines. I was very impressed by Mavrič (a superb Jacot and Sivi Pinot), Iaquin (whose production is tiny but who own a couple of very attractive looking guest houses), Čarga (whose Rebula is superb, as is their Cabernet Franc which is actually 75% Carmenère) and Ščurek whose blends – both red and white – were great wines. The view from the Belica Hotel. The building in the middle distance on the right is Movia. In the middle of the photo is a white building with a small road in front of it. That road marks the frontier. 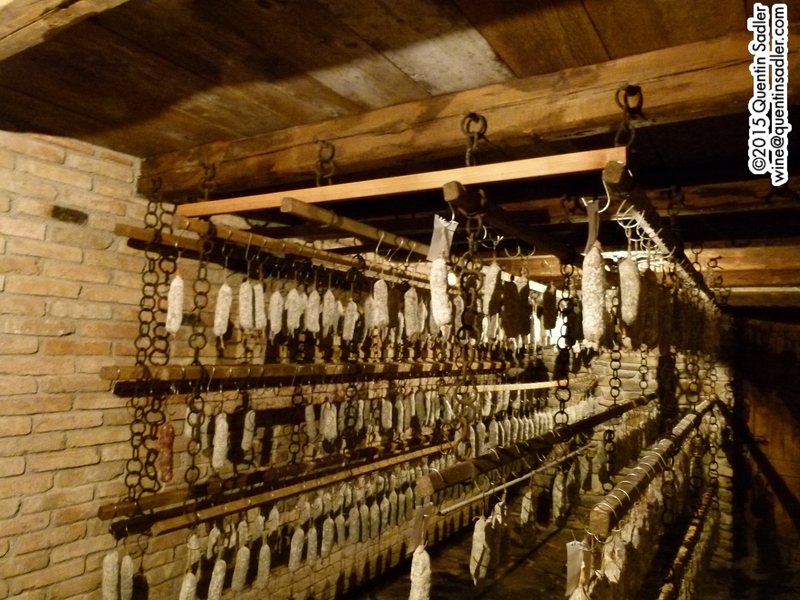 Wonderful home made sausage drying at the Belica Hotel, they make superb ham and cheese too. 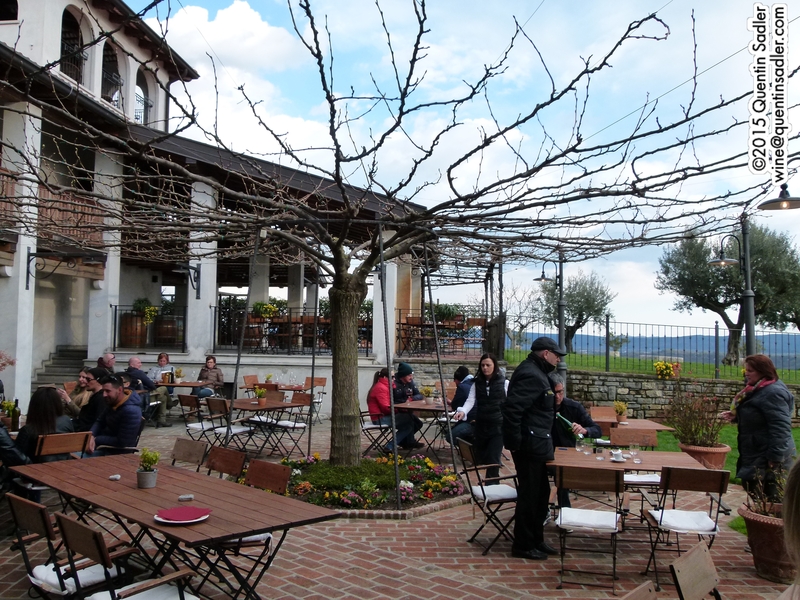 The lovely and popular terrace of the Belica Hotel in Brda. We also visited Movia, which is one of the star wineries of the country. The quality is very high and the wines are very exciting. I have been before, but this was a very different visit, so will write about it separately. We were also treated to a tasting of the wines of Marjan Simčič, who is a great winemaker who made some of the best wines that I tried on the trip. I have met him before and tasted his wines several times and they never cease to thrill me – I will write about him very soon too. The other sub-regions of Primorje are: Koper, named for the beautiful town of the same name, this covers the coastal area and is the warmest and sunniest part of Slovenia. This coastal region – along with Kras – is where you find most of the Slovenian Refošk or Refosco. Just as with Malvasia, there appear to be several different Refoscos, which may or may not be related to each other – strangely it seems that the grape is also the Mondeuse Noire used in France’s Savoie Region. 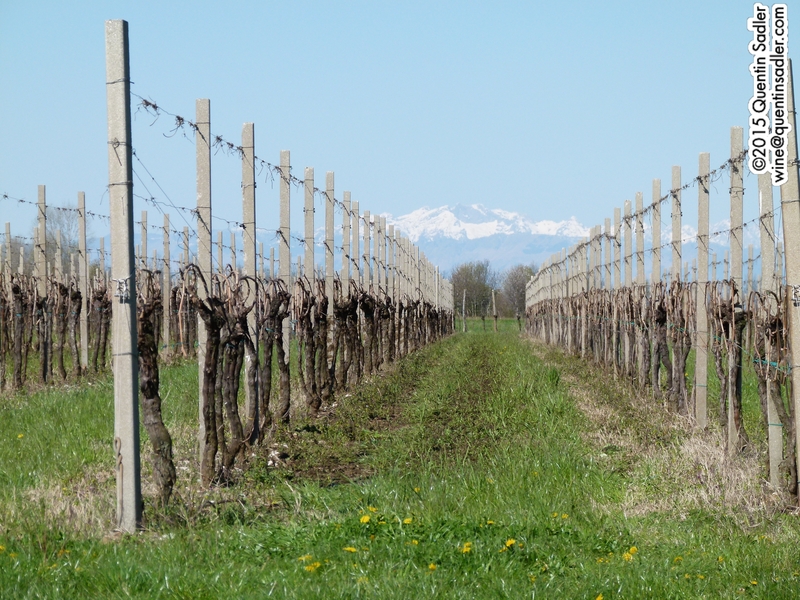 The low yielding Refosco dal Peduncolo Rosso is the variant most commonly used in Friuli and is named for its red stems. 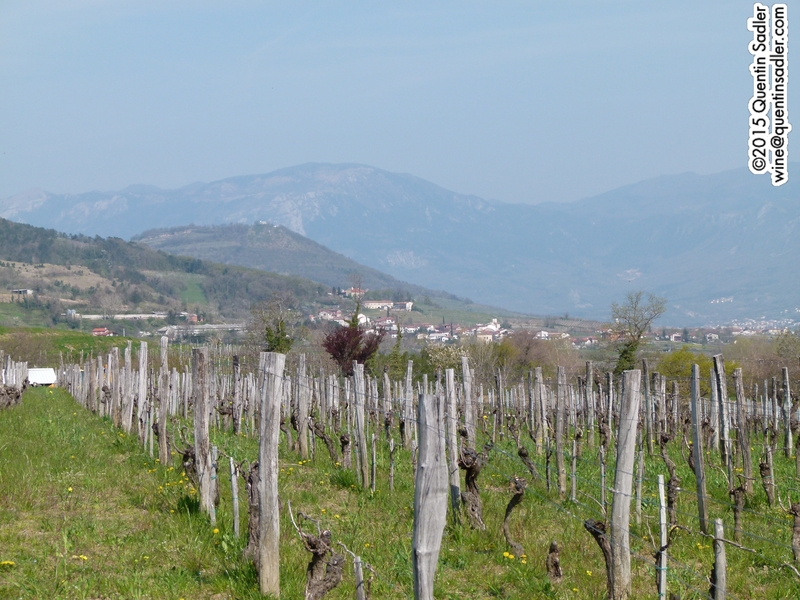 Slovenia by and large uses the higher yielding Refosco dal Pedunculo Verde, which has green stems. Either of them might or might not be Teran when grown on Terra Rossa soils, or Teran might be a separate strain, sources disagree and I have not been able to find a definitive answer. Refosco has high acid and high tannins, so can appear somewhat rustic to the unwary palate. Modern winemaking can get around this and I have tasted some delicious examples from both Italy and Slovenia, I would particularly recommend the Refosco from Tenuta di Blasig in Friuli, the Refošk from Santomas in Koper and the Organic Refošk from the Polič Estate between Koper and the Croatian border. 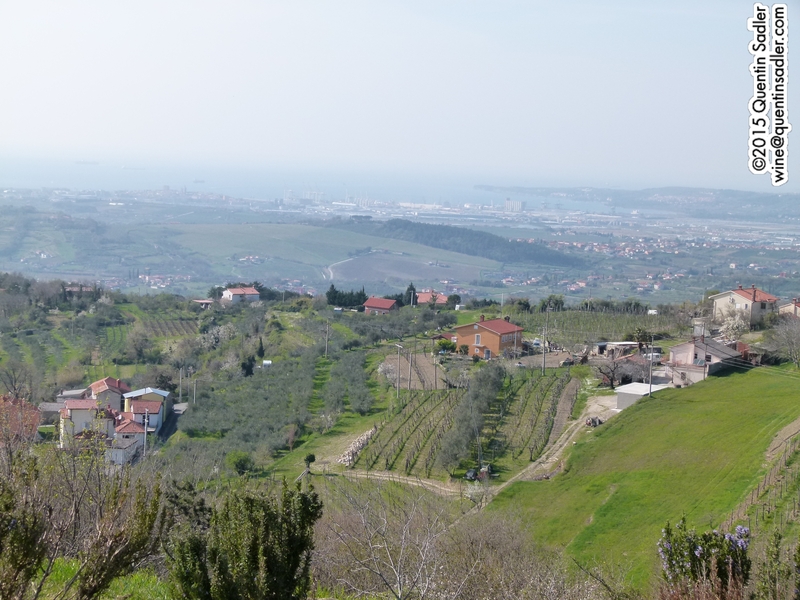 Looking towards the city of Koper and Slovenia’s tiny 46.6 kilometres (29 miles) of coastline. Sparkling pink Refošk aperitif at Viña Koper with Ann Samuelsen. The Kras, or Karst, is a limestone plateau just inland from Trieste, it is riddled with cave systems and underground rivers and gives its name to this sort of landscape worldwide. A visit to the Postojna Caves is an incredible experience and one not to be missed. Henry Moore described them as ‘the best exhibition of nature’s sculpture I have ever seen’. Lipica Stud Farm is another attraction worth visiting in this area. The soils here are iron rich red terra rossa and that iron minerality often finds its way in to the wines. The climate here is harsh and variable, storms are frequent and winds powerful, but the wines can be very rewarding. The beloved local speciality is Teran, which is a type of Refosco, as far as I can discover it is probably a local variant of the Refosco dal Peduncolo Rosso (although it might not be) and as you might expect it is also produced in the neighbouring Italian Carso DOC. We did not visit any wineries in Kras on this trip, but I have been very impressed by the wines from Čotar in the past, especially their Cabernet Sauvignon and their Terra Rossa red blend of Teran, Merlot and Cabernet Sauvignon. 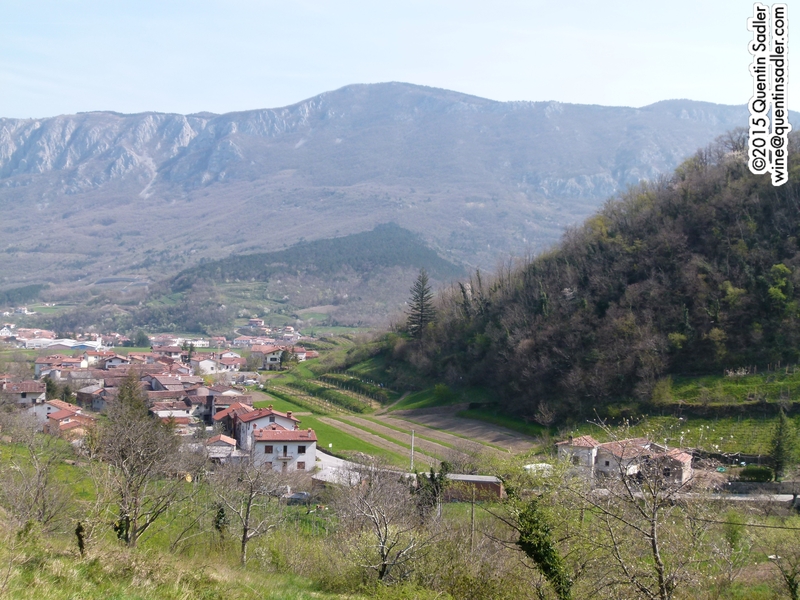 The Vipava Valley is a beautiful place just inland from the Kras and Koper. Strong winds rip through here, tempering the conditions and making a sub-Mediterranean climate and allowing them to make some stunning light and fresh white wines and some very elegant reds, including some made from the Barbera grape more commonly associated with Piemonte in north western Italy. One of my very best experiences on this trip was a wonderful tasting and lunch in Vipava with a handful of generous and passionate wine makers who showed us some thrilling wines. The quality impressed me enormously, especially the wines from Sutor, Tilia Estate, Posestvo Burja (an organic producer that still makes the field blends that were the traditional style of the area until WW11), Lepa Vida (whose oOo is one of the most enjoyable Orange wines that I have ever tasted) and Guerrila who produce stunning white wines made from the local Zelen and Pinela grapes, as well as very toothsome red blends. 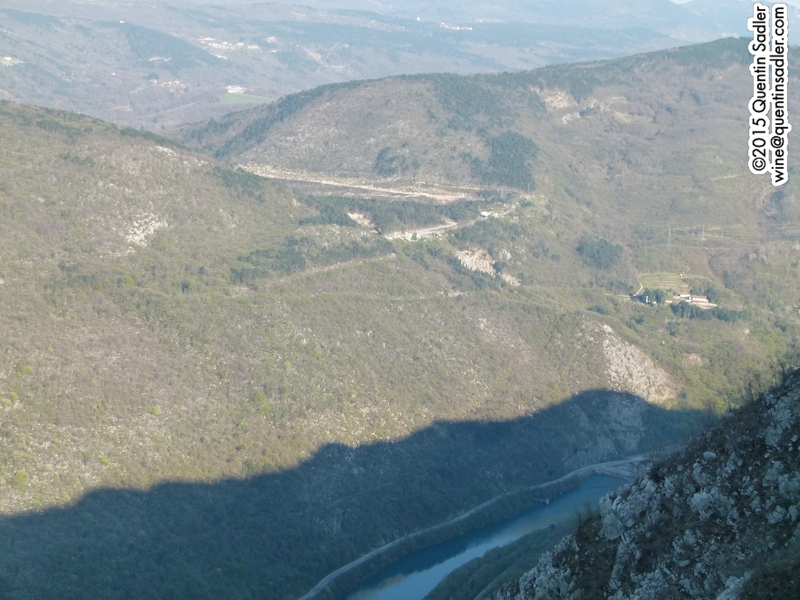 Looking down on the Isonzo River and across to the north west. 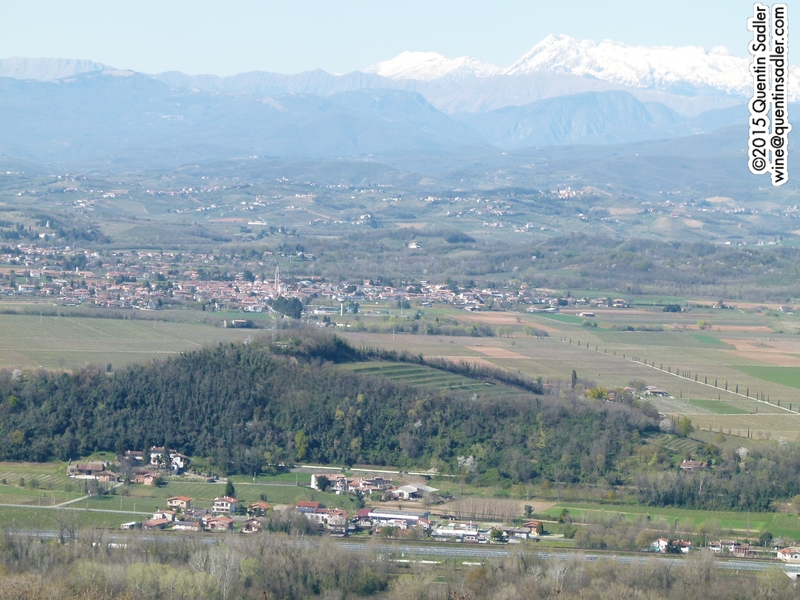 In Italy we visited the Isonzo area, which is basically an alluvial plain with the mountains to the north and east, beyond Goriza and Trieste. It is warm and sunny, but tempered by the winds and ocean breezes and the effects of the Isonzo River (Soča in Slovene). I was very impressed by all the wines of Tenuta di Blasig and some of the Pinot Grigios that I tasted. It is very unusual for me to like Pinot Grigio, but they just seem to have so much more character and interest here than the bland examples that most people drink in the UK. I particularly enjoyed the Pinot Grigio from Masùt da Rive. 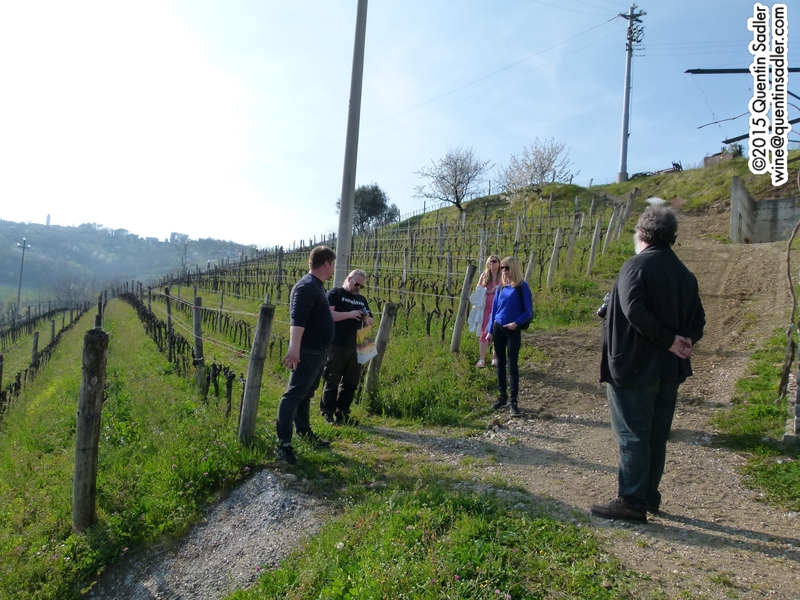 Some of our little group in a vineyard in Collio. 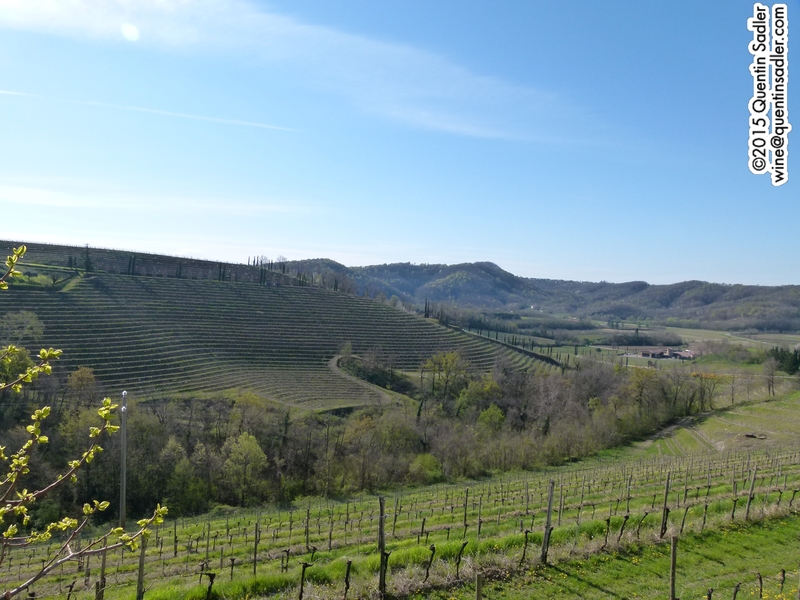 Collio, or Collio Goriziano, is historically the same region as neighbouring Brda before the 1947 border split them up and the words mean the same things – hills. As you might expect both sides of the frontier are very hilly, but in a very attractive, gently rolling kind of way – it really is a delightful landscape. Just as in Brda the range of grape varieties and wines made from them is enormous, from both single varietals and blends, but production favours whites more than reds. Ribolla Gialla and Friulano might well be the signature grapes here, but both Pinot Grigio and Pinot Bianco are produced, as are Malvasia, Sauvignon Blanc and Chardonnay. 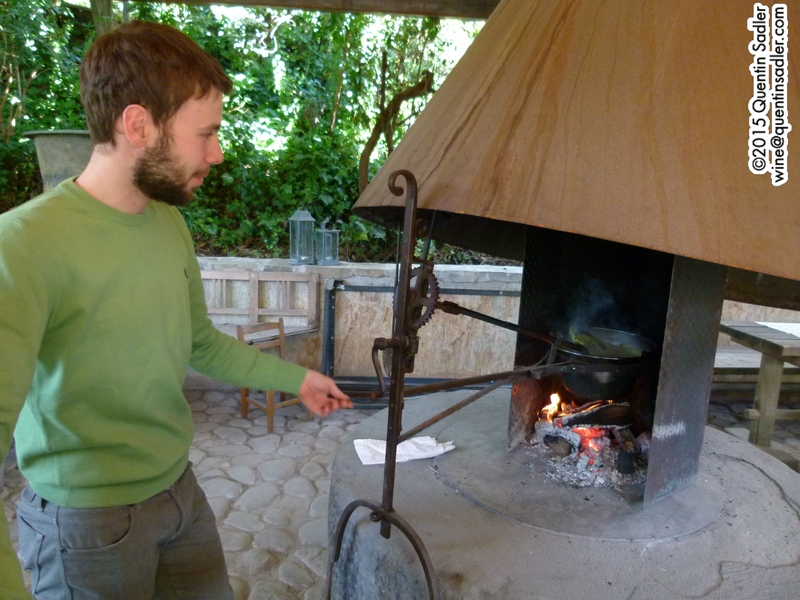 Cooking the polenta at the Osteria de la Subida near Cormons in Collio. I have never really warmed to Friulano, I have always considered it a very odd grape, it is certainly hard to pin down. Long known in Italy as Tocai or Tocai Friulano, it was likewise called Tokaj in Slovenia, but it has nothing to do with the Hungarian Tokaj at all. It is actually Sauvignon Vert or Sauvignonasse, which was widely planted in Chile where it was believed to be Sauvignon Blanc – it isn’t. Well you will be pleased to know that on this trip I did warm to the Friulano grape and had some splendid examples in every region that we visited, but perhaps my favourite was a single vineyard wine made by Raccaro, their Friulano Vigna del Rolat. I also greatly enjoyd the wines of Carlo di Pradis and Borgo del Tiglio. 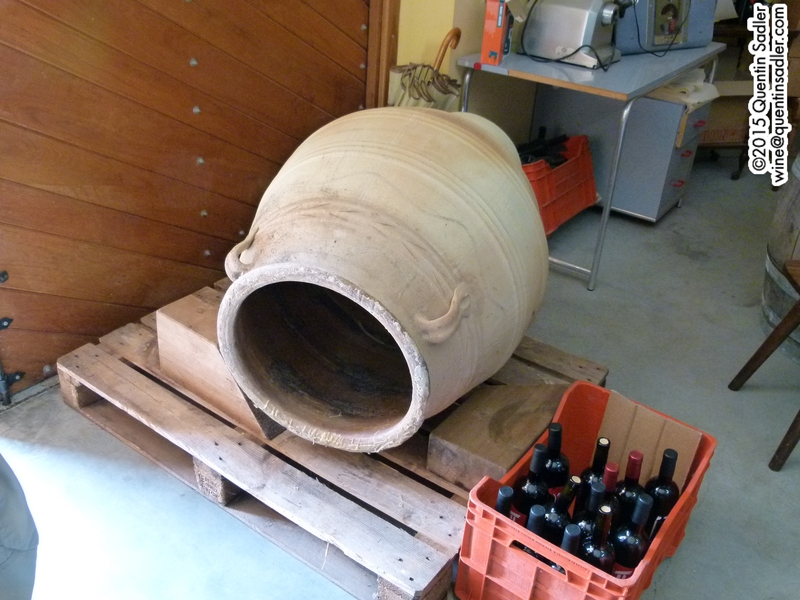 Amphora like this are increasingly being used as fermentation vessels for orange wines in Collio. 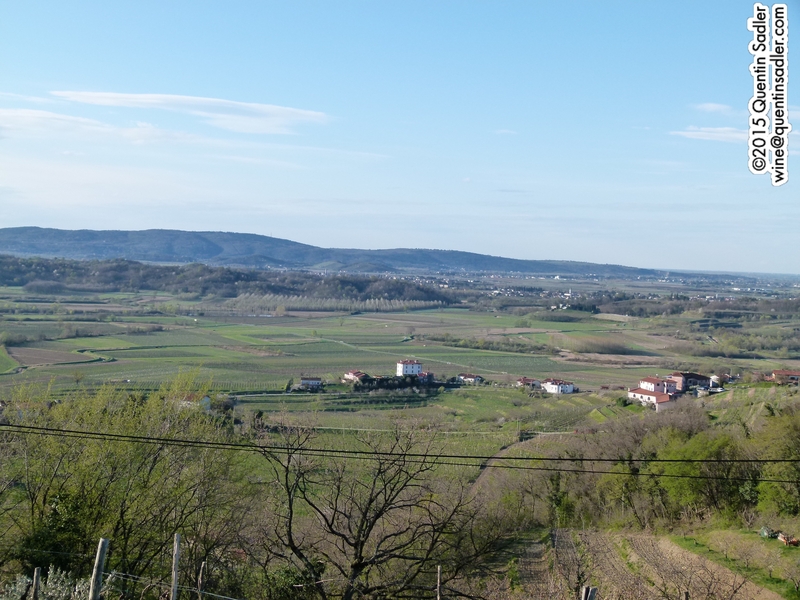 We returned to Collio a few days later to stay in a place called San Floriano del Collio, which though in Italy had a view of our first hotel just 3 or 4 kilometres away in Slovenia. Whilst here we visited Oslavia a village a kilometre or 2 further south and it was a fascinating day. Firstly it was a very beautiful place, secondly all the ‘Italians’ that I met spoke Slovenian and thirdly the wines were fascinating. I must admit that I even found the name Oslavia interesting, surely that means place of the west Slavs? If so how amazing that it is about as west as Slavs can be found even today. The focus for this part of the trip was the local speciality of Ribolla Gialla, although we tasted other wines too. Ribolla is said to get its name from the fact that historically the wines were not very stable and would re-ferment, so bubble away and look as though they were reboiling. The grape is not very aromatic and can seem a bit strange when you first taste it, but there are some superb wines made from it. Most of the wines that we tasted here were Orange wines, white wines made with long skin contact – hence the orange colour – they were also organic and often biodynamic and low sulphur too. I have to be honest, wines like that are not often for me, I usually find them more interesting than drinkable, but I did try a few here that were both. Fiegl’s wines impressed me, but these are the only ones here that were not Orange at all and instead had freshness and purity. The others were about the complexity of long skin contact and barrel ageing on the lees, sometimes for years. I was very impressed by Primosic, whose 2010 Klin was my wine of the day. Radikon also made an excellent Ribolla, which is officially a wine with no sulphur, as the amounts are so low they cannot be measured – I have never seen that before. I also liked their Slatnik blend of Chardonnay and Friulano. Dario Prinčič also makes a fascinatingly complex Orange style Ribolla. Colli Orientali was an interesting place to visit too, if hard to get a handle on. It is a big place with lots going on. Lots of grape varieties and lots of blends are produced here too. Historically it has been seen as more prestigious than Collio and the wines were certainly more visible in the UK than those of Collio. One reason might be that this is often said to be the birthplace of varietal labelling, soon after World War 11, so the labels were easier to understand, who knows? Again this is mainly a white wine region, or at least the wines that have made it famous and prosperous tend to be white, but plenty of red is made too. 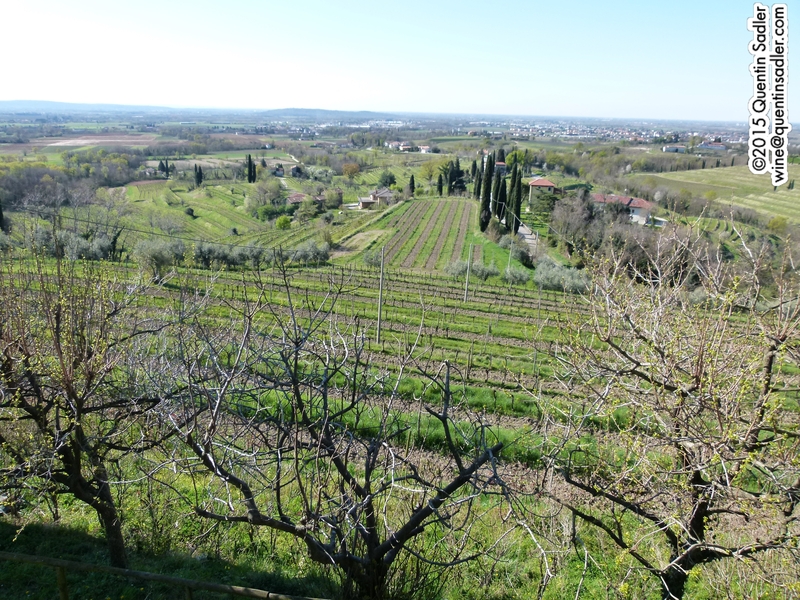 Dry white wine production is dominated by Friulano, Sauvignon Blanc, Pinot Grigio and the local Verduzzo, the best of which now has its own DOCg Ramandolo. Picolit, another local grape variety, is used to make light sweetish wines. 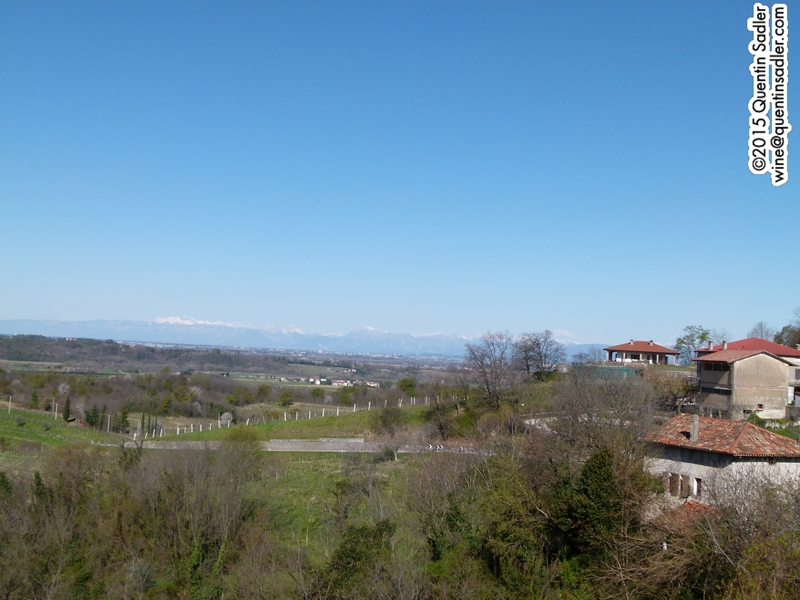 Looking north from Colli Orientali. Although plenty of famous black grapes are grown and red wine is made, the speciality red is Schioppettino. This grape variety was rescued from near extinction only in the 1980s and is enjoying something of a modest renaissance, which is good as the wines seem to be very good, with a lovely rich fruity quality, smooth texture and delicate spice characters. Looking west from Colli Orientali. 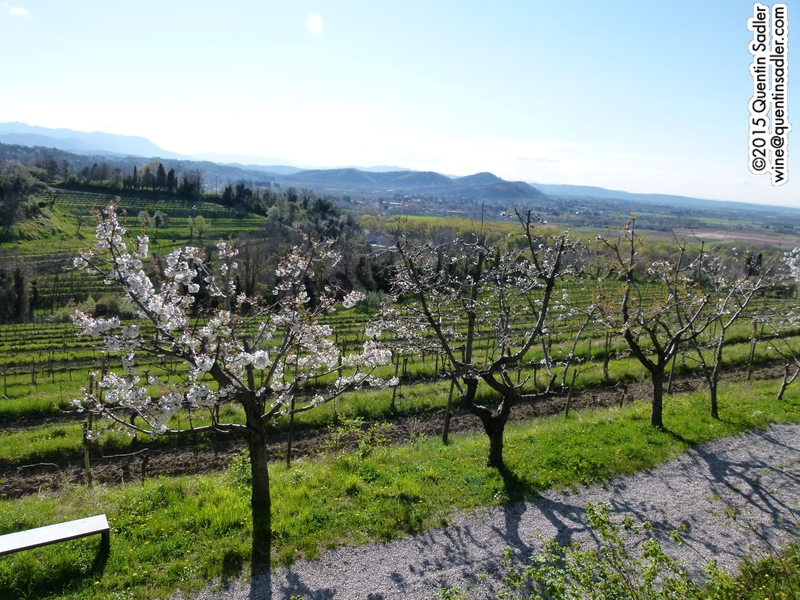 We visited the rather lovely Azienda Agricola Moschioni where we were able to taste a wide range of local wines produced by them and other local wineries. I was very taken with the wines of Bastianich, particularly their Friulanos, white blend and incredibly concentrated Calabrone red blend. Rodaro‘s Schiopottino Romain made from dried, overripe grapes and aged 18 month in barrel was a delight, as was their intense Refosco dal Peduncolo Rossa Romain. I was also really impressed by the concentrated and spicy Moschioni Shioppettino. Looking down on the Isonzo from Mount Sabotin / Monte Sabotino. Some of the fiercest fighting of WW1 took place in this terrain. I loved this trip to this wonderful part of the world that is somewhat neglected by tourists, certainly ones from the UK. I loved the countryside, I loved the people, their food, their wines and their spirit of hospitality. I even got the chance to clamber about in some of the First World War trenches high on Mount Sabotin / Monte Sabotino where some of the fiercest fighting took place between the Austro-Hungarians and the Italians. Ethnic Italians and ethnic Slovenes fought on both sides and today share this landscape in a peaceful, productive and creative way. So many things are better today, I just cross my fingers and hope that Europe does not revert back to the destructive ways of nationalism and formal borders. We all suffer if we do that. People suffer, our culture suffers, our pleasures diminish and wine will be the poorer. I like my Wines Without Borders.